Thanks to everyone for their iron input from this post. My Oliso iron was dropped and the prongs that make it go up and down stayed permanently up. So I began my quest for a new iron. Your comments really did help me. I was all over the map when reading them. I was up and down on several different irons and price points as I read. I had almost decided on a Reliable iron (very top of the line and price point but pretty orange). But, I finally listened to Lynn, whom I trust from a long blog relationship, and to Beth. Kati also had an opinion about the Black and Decker, which I appreciated and considered. Along the way I also acquired a low end iron from Hamilton Beach, which may or may not be without some value. Also, I still have an older Rowenta, that has been the family iron for ironing clothes. This was not kept in my sewing room but I did move it in to my sewing ironing board while I considered options. Here are the current 3 irons I own. The Rowenta on the right. The Hamilton Beach in pretty aqua, and the Black and Decker Digital. Now, one recommendation that came up multiple times in comments was to shop thrift stores for great buys in irons. 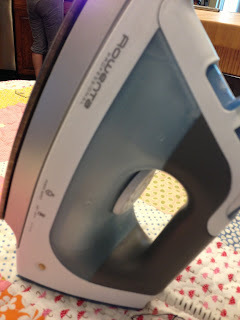 I guess with fabrics and life styles today people really don't use irons much so there is the possibility of a great iron, barely used, that is sitting in a thrift store at an under $5.00 price point. I'm not the kind of person that happens on stuff like that very often, I will say. But I know lots of people score like this. I can't remember how long I've had this Rowenta. I have had several Rowenta irons over the years. My favorite was the one with the separate water well. That model is just too big for my little sewing/pressing area. 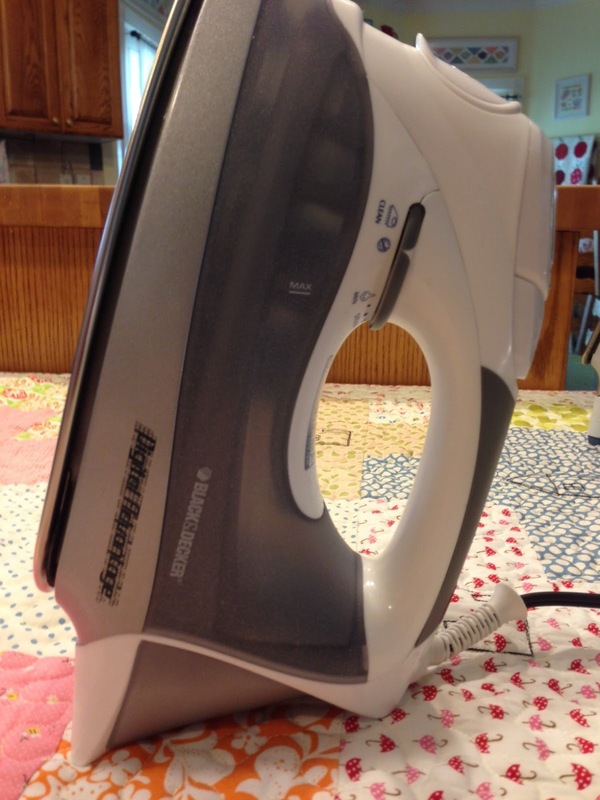 I originally purchased this iron above for my sewing room at a fairly high price point at just under $100.00. This iron worked well. It was again, dropped, over time. So now you can't add much water without it leaking out. So it is kind of inconvenient because I feel like I'm constantly putting a small amount of water in it. Rowentas tend to spit and drip anyway, overall. I don't like the spout design for adding water. The iron is heavy enough and gets hot enough. Also it doesn't turn auto off too quickly, which I like. But there is no way to completely turn off the iron without unplugging it. I don't really like that but I know that is how irons are these days. I've been using this since the death of the Oliso and it works well enough but I'm ready to move it back to the family iron status. This little Hamilton Beach is so cute. It is pretty and would be the perfect accessory to any sewing are. Since I haven't used the iron, I can't say how well it works but I will be trying it out. My first thought is that it is light as a feather. And we all know that is a bad feature in a pressing iron. It also is made pretty cheaply but it is priced under $20, so you may get what you pay for. However, since it is light weight, it might be good for a someone that doesn't iron much or that would be packing it around from class to class. And it's cute. Right. I'll let you know later how it works. Same for this iron. I haven't used this B&D yet, but this was the iron I purchased after the blog post. It is a mid range in price, which is good, it is digital, which I really like, and seems to heat up lightening fast. It is a great weight, probably better than the Rowenta. This is iron gray, which is fine. But I wish it was aqua. Why not? I like how the handle is set up with the buttons and I really like that I can turn the iron OFF! 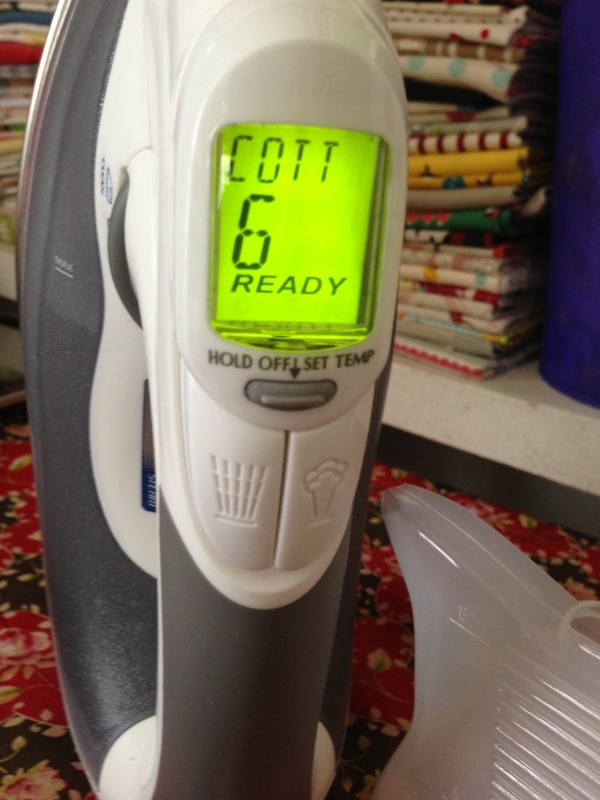 So many irons now have the auto off, which this one does, too. But you can't turn them all the way off without unplugging. With young children in my home, I really like this feature since my iron is set up all the time. The B&D takes a good amount of water, too. It took 2.5x that little water pitcher (came in the box). Kati had a concern about the holes in the plate. I'll watch for that. I haven't really used it much yet, but I will keep you posted. 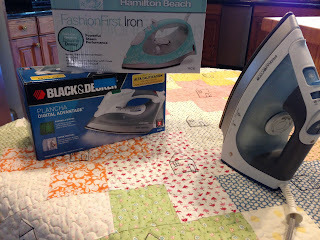 For all of you looking for an iron, you might check out Sew We Quilt. They are give out THREE! of the high end beautiful orange Reliable Irons to celebrate Mother's Day. Head over to this post and follow the instructions to win. Three is great odds. I'm going to enter, too. Hey, at the rate I go through irons, I need extra! I have the B&D digital advantage and like it a lot. I also have a Rowenta travel iron that I keep next to my machine, and despite my being careful with it, the little swivel thing where the cord meets the iron broke when it was maybe a year old. Luckily no wires are exposed so I can still use it. Thanks for the info! I have a tiny travel Rowenta for years that I LOVE, because it heats up FAST, gets REALLY hot, and it doesn't have auto-shut off (I know, I know, but...). Then it stopped worked about a week ago, inexplicably (it's OLD). keep us posted, Nanette on what you decide. I am always so frustrated with irons, and keep re-buying the el cheapo's over and over. Now I buy el cheapo B&D's and don't feel bad when they finally give up the ghost, which is far longer than that high $ one! I also go through irons. I buy mine at DI. Cheap I know but I've had great luck so far. I bought an iron at Costco 5 years ago for $30. It stopped working, I returned it and they gave me my money back. I was shocked! I bought a Rowena at Costco for $60 and absolutely love it! It's interesting how everyone has their personal opinions and experiences about irons. Sewers, that is!!! Well you know I'm no help here...I always use vintage irons and can't imagine sing anything else. I do like the cute aqua iron though!!!! 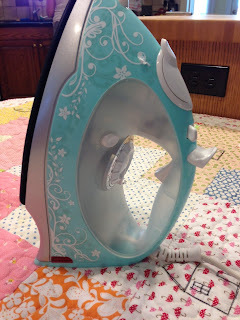 My question is - Why can't they make irons in pretty colors? I've never had a problem with the holes in the plates. In fact this is the only iron I've had that doesn't leak. I could talk for a long time about my iron tribulations over the years. Next I'm going to tell you all about my new leaf blower! I bought the Black and Decker last year, (thanks to great reviews on Amazon) and its the BEST iron I've ever owned - by far! Thanks for this and upcoming posts about irons...good information! Very informative Nanette -- thanks for all the info -- you never know when you're going to need a new iron. That digital iron looks really cool too. Maybe soon they'll have digital irons that can receive text messages, peruse instagram and play music! I have had the black and decker for 2 years now and love it. It gets very hot, and the steam is wonderful. When I first started making quilts I tried the Rowenta and did not like it at all, it always wanted to leak. I then found the B/D and loved it. I wanted a second iron so about six months ago I purchased a Reliable iron (the pretty orange one) and didn't like it either. I have also tried the Oliso. Nothing compares to my little B/D that I purchased at an outlet mall for about 30.00. You made a good choice. Oh that aqua is a cutie. Would be a great grad gift. Let us know how it does. I love my Rowenta, but I wish it were orange :). I still do have have the perfect iron so I was interested to see what you would choose Nanette! I, too, have the B/D. I have had it about a year and really like it. I have had 3 Rowentas and they all leaked and sputtered after a while. Just don't think they are worth the price.